Many have surely watched The Simpsons over the years and, much like Homer, dreamed of drinking a big, cold glass of Duff Beer. Well, that is going to be a dream come true for those lucky enough to live in the Burbank or nearby Los Angeles area, as an official Duff Beer pop up is heading to California this weekend for one day only. According to a post made by the official Instagram account for The Simpsons, Lincoln Beer Company will be serving Duff Crafted Lager on Saturday, November 10. The official social media accounts for the brewery backed that up as well, showcasing the special taps they had put in, familiar red labeling and all, just for the event. They also have a very cool Duff Beer glass on display in one photo. The best part? Lincoln says that patrons get to keep the glass with their first pour. Here's what The Simpsons account had to say as far as official details go. 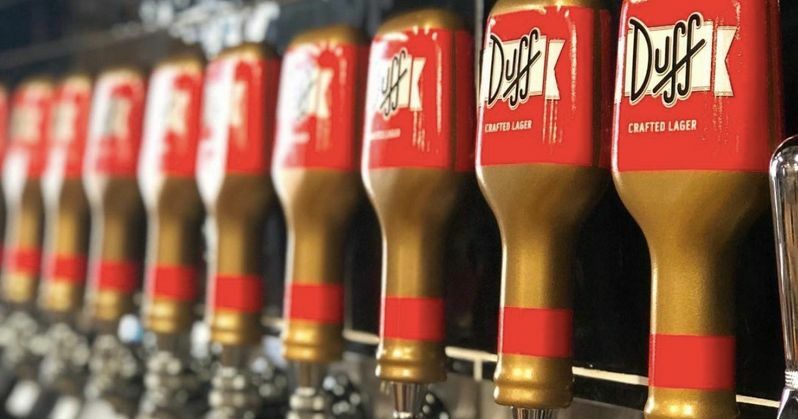 "Duff PopUp Lincoln Beer Company 3083 N. Lima Street Burbank, CA 11.10.18 2-10PM 21+ #OfficiallyDuff"
Duff Beer in the world of The Simpsons is arguably the most significant fictional brand. It's the Budweiser of their universe. It's the everyman, blue collar beverage of choice. While many feel the show has maybe lost a step or two over the last large chunk of its run, interest in actually getting to try Duff first hand certainly hasn't waned. This offers longtime fans that very chance. Who knows? If this goes well, maybe we'll actually see Duff show up in more places around the country. For the time being, there are only a couple of places one can get an official Duff Beer, and that is at the Universal Studios theme park in Hollywood and Orlando near The Simpsons ride. Also, Fox began selling a version of the beer in Chile in 2015, but that had to do with other companies trying to illegally hijack the brand. So they stepped in to try and mitigate that a bit. For those who haven't had the chance to hit up Universal Studios, the beverage has remained elusive. Though, Fox did start selling Duff energy drinks a few years back but, aside from the novelty of it, they just don't scratch that same itch. It's important to remember that, come next year, The Simpsons will ultimately be controlled by Disney. Odds of the Mouse House dishing out officially licensed booze are slim to none. So for fans anywhere near Los Angeles who have ever wanted to taste a Duff, this is probably the time to do it. Perhaps Duffman will even show up. And hey, if things go really well, maybe they will roll out the "semi-imported" version of the beer, Duffenbrau, which is typically reserved for high-ranking officials like Mayor Quimby, down the road. Be sure to check out the announcement from The Simpsons Instagram account, as well as some photos from Lincoln Beer Company below.